Your new cover comes to you with a protective liner do not remove liner until prompted by instructions. 1. 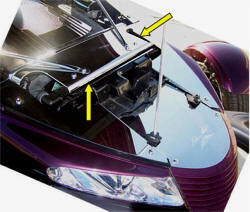 Remove the two main bolts securing the engine bay support bars to the factory radiator support and slide them to the sides. NOTE: These two bolts will be replaced. 2. Place the two 1/8 thick washers over these two bolt holes. 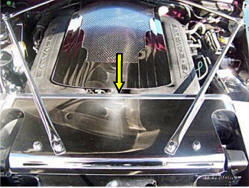 Place the new cover over the factory radiator cover and allow the two outer factory nuts to protrude thru the holes in the cover. Remove protective liner. 3. Slide the support bars back into position and secure them in place with the two stainless 6mm bolts and flat washers provided. 4. 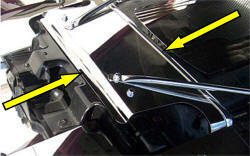 You have been provided with four decorative chrome caps for each of the four nut & bolt locations. Simply press them in place.